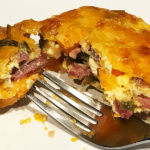 Cheesy breakfast casserole has become a favorite, and our must-have meal on a busy weekday or holiday morning. It is such a versatile dish. You can make the casserole and bake it right away. Or, if you prefer, you can make it the night before and bake it in the morning. The egg mixture poured over the meat, potatoes, peppers and onions in an 8 inch baking dish. 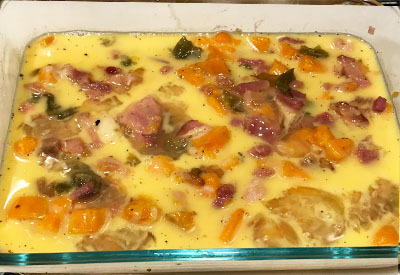 We first started to make this cheesy breakfast casserole when the kids were young. It started as a Christmas morning tradition. We knew that they kids would be busy on Christmas morning, and there was no time for us to spend in the kitchen preparing a hearty breakfast. Cook the potatoes until fork tender and add the cooked breakfast meat and veggies until heated through. We made the casserole overnight and while the kids opened their gifts, we pulled the casserole out of the refrigerator to warm up. We then baked it per the directions and when everything settled down, breakfast was ready! Our original casserole included chunks of bread slices. Although that is still a special treat once in a while, we have scaled back our original recipe to be a little less carbohydrate heavy. The beauty of this cheesy breakfast casserole is that you can customize it with what breakfast items that you like. The filling has been heated and half of the cheese ready to be stirred in. This recipe calls for any type of cooked breakfast meat. 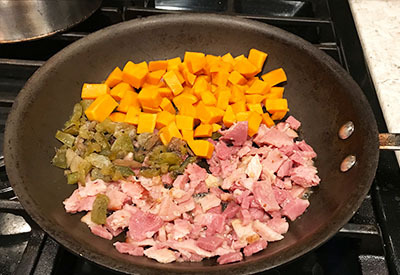 Sometimes we use diced ham that we have frozen, precooked bacon or browned sausage. And sometimes we even use a leftover hamburger from last night’s dinner. And when we have guests that are vegetarians, we ditch the meat all together. The choices are endless. If you don’t like onions, you can omit them entirely. Prefer mushrooms? Feel free to add them in as well. And don’t feel like you have to stick with just cheddar cheese. We have added our last bit of pepper jack or swiss when needed. Bake until the eggs are set and firm in the center. The important thing is to spend time with your family and friends and not over a stove when you don’t have to! 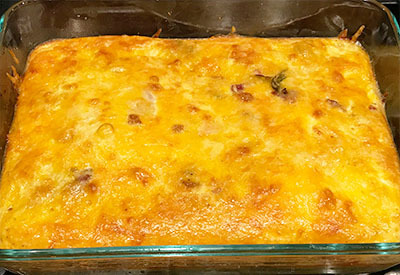 Delicious breakfast casserole with potatoes, eggs, peppers, onions and cheese. Make it your own by adding in your favorite veggies. Make immediately or refrigerate overnight prior to baking. Spray an 8-inch baking dish with nonstick cooking spray. In a medium bowl, whisk together eggs, milk, hot sauce, salt and pepper. Set aside. In a large skillet, heat olive oil over medium-high heat. Once hot, add in diced potatoes. Cook until just slightly fork tender. Add cooked breakfast meat, onions and bell peppers to the hot pan. Heat for 3-4 minutes, stirring frequently. Remove from heat. Stir in 1/2 cup cheddar cheese until well combined. Place sausage mixture evenly into the prepared baking dish. Pour egg mixture evenly over the top and sprinkle with remaining 1/2 cup cheese. Either: Bake immediately for 35-40 minutes, or until the eggs are firm or let mixture cool and refrigerate overnight. If you are going to refrigerate prior to baking, take the dish out of the refrigerator for at least an hour prior to baking. I don’t see the diced potatoes on the ingredient list. What amount?? Thank you for catching that! I have updated the recipe. 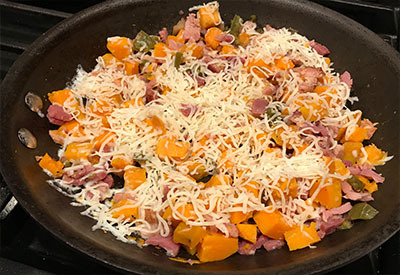 I have also used a sweet potato in this recipe and it is delicious as well!